I went to a natural gift making workshop (which I will blog about sometime soon) and got into a conversation about druidry with one of my fellow workshop participants. Turns out, she runs a local TV show called “Faith” and she asked me to come in and talk about Druidry for her show in an upcoming episode. I find it a bit nerve-wracking and intimidating, mainly because of how open and “out” the show is but also because I really want to try to represent the diversity of druidry accurately. But I still agreed to do it because its also a great opportunity to build tolerance and understanding in our community, especially among other people of diverse faiths. And I generally don’t think these kinds of opportunities come along very often, and when they do, we really ought to take them. An Acorn. Acorns have a deep and rich symbolism in druidry. As I’ve written about in other blog posts, druid literally can be translated as “oak knowledge” and the oak is a symbol of druidry. Oak knowledge traditionally dealt with the survival of the Celtic people, and while that is still true, it can also be more broad. So we might see “Oak knowledge” referring to knowledge of growing and harvesting foods organically, foraging and harvesting from the wild, and knowledge of sustainability and permaculture. But oak knowledge can also include knowledge of stories, myths, and spiritual traditions of the ancients, the druid revival and modern druid era. Because druidry is a living religion/spiritual path, we might also see oak knowledge as our understanding of how nature can help us solve our substantial challenges in the 21st century. The acorn, as a seed, is also a symbol of growth and unlimited potential. 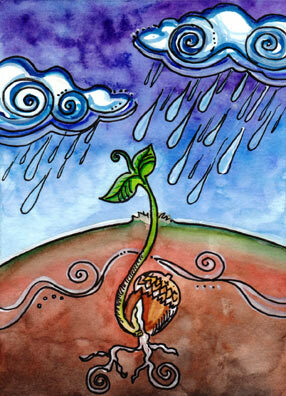 The acorn, in its dormant state, reminds us that we, too need periods of rest/dormancy and periods of growth. We, too, must look to the oak and understand the importance of living within the seasons, with grace and harmony. The acorn teaches us about our own potential–how one acorn can grow into a massive oak and seed a whole forest. The oak tree is only partially seen–the massive root system of an oak tree is as tall and wide as the tree itself. This teaches us that there is much to living and our spiritual experiences that we can’t see, and that even though the roots can’t be seen, we can see their influence. 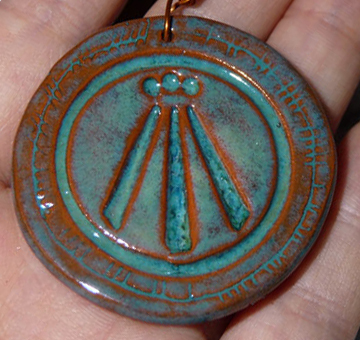 An Awen Symbol. Awen, a Welsh word, describes the spark of creative or divine inspiration or illumination. Awen is what sparks an idea and gives it form. The ancient bards drew upon Awen in the process of composing their beautiful stories and music. Today, we druids embrace creativity as part of our spiritual path–the creative arts: music, dance, song, painting, woodworking, baking, crafting, knitting–so many of these are critical to living a happy and fulfilled life. Awen is so important to druids that many of us use the Awen symbol as our primary symbol of druidry. A stone from our grove’s circle. Stones are also central to druidry, we can look back in our tradition’s history to the root of druidry’s inspiration–the ancient druids and their stone structures. The importance of historical sites and modern stone circles (such as the one our own grove celebrates in) teach us the importance of understanding our history. 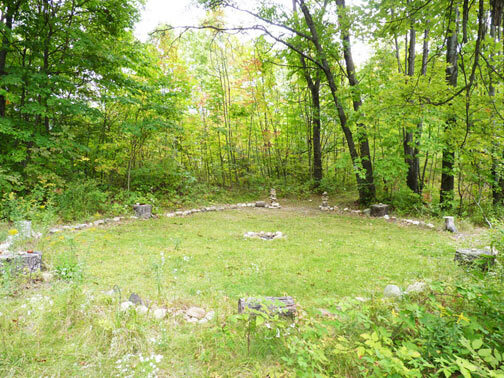 Stone circles today give us a sense of community; as a grove, we meet within the circle to celebrate the passing of the wheel of the year, to welcome new members of our order through initiation, and to seek peace, meditation, and communion with nature. And stone circles are being recognized as important points for earth-based spirituality, such as the recent press that the Air Force Academy built for its cadets. A stone from our circle here in South-East Michigan also represents our connection to and reverence of the local land and her unique history. We can also talk about the stone representing earth, and then think about the four elements that druidry often emphasizes: earth, air, fire, water, and the importance of balancing between those different energies. Myself. Druidry is a living, evolving tradition that seeks inspiration from the past without being bound to it. Its also very unique to teach individual, and is truly a personal path, where each of us walks his or her own path, while being bound through our mutual respect of the living earth and our broader community. My crane bag. The crane bag is a druid’s working tool, and something that many druids put together to keep all their various magical and mundane tools in. I’ve blogged about crane bags here. Mistletoe. Mistletoe is mentioned in some of the ancient Roman writings concerning a druid, specifically, a group of druids in white robes with a silver sickle knife cutting mistletoe growing from an oak in the moonlight. So this is an image that is important to many druids (and is something we usually incorporate into our Yule ritual). The OBOD’s Mistletoe Foundation is focused on understanding mistletoe in relationship to druidry, to preserving it, and to studying it. Mistletoe, as an herb, can also teach us about herbal lore, which is yet another important aspect of druidry. What other symbols of druidry would you include, blog readers?